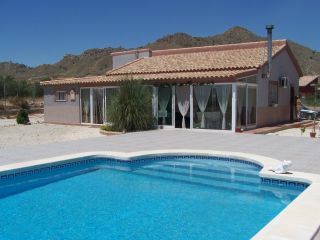 This beautiful Villa is located within a short 5 minute drive to both of the popular and sought after areas of the historic and pretty Abanilla & Fortuna with its renowned Thermal Spa, and 20 minutes to the center of the stunning city of Murcia. This great home is approx 120m� and has 3 spacious double bedrooms (the master of which has a huge en-suite & walk-in wardrobe / study), 2 bathrooms, a wonderful Winter garden room which overlooks the garden, pool and the fabulous surrounding countryside, and a large open plan living room with log burning stove and an American style kitchen which leads to a Summer kitchen and BBQ area. On its fully fenced plot of 2,200m� there is a fabulous 10.5m x 5.5m swimming pool which has 360� views of the surrounding countryside, a BBQ area, covered dining area, utility room and a storage room. This wonderful home is fully furnished with quality furniture, includes all of the white goods, has air-conditioning, plenty of parking areas, landline telephone with internet access and has mains water and electricity! A gorgeous, bright & airy property�.just move straight in and enjoy!